A magnificent amore diamond necklace from Chopard. 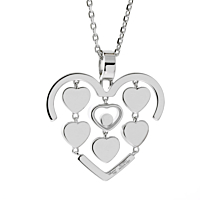 The 18kt gold open heart necklace is filled with three columns of tiny solid white gold hearts linked together, with one heart featuring a brilliant (.05ct) round diamond. It is connected to a round gold loop that hangs gracefully from an 18kt white gold chain necklace.